If you have been here awhile, you know I am a huge proponent of play in the classroom. I am truly blessed to teach in a school where my kindergarteners play every day in the classroom and it is encouraged and supported. 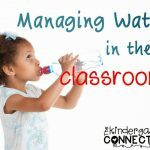 However, I know that isn’t the case for so many early childhood teachers around the world, so when I received this post from Andrea, I knew it would be so valuable for teachers looking to increase learning through play in any way they can! We know we need more play in our classrooms, but we are pushed to meet academic standards. We are told to prepare students for testing. We are discouraged from allowing students to “just play.” Fortunately, it IS possible to incorporate more play, meet academic standards, and maybe even convince others of the value of play while we are at it! 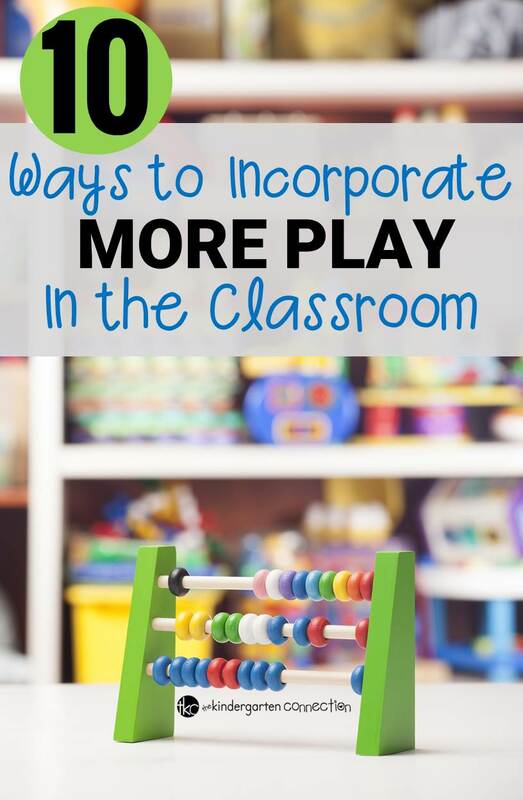 Here are 10 ways you can incorporate more playful learning in your classroom – starting today! 1. Create play-based learning centers. This is an easy way to sneak play into your daily routine. Whether traditional play centers (sand, dramatic play, blocks, etc.) or a collection of bins on a shelf, having play materials available is the first step to adding more play into your routine. If you don’t yet have centers, start with a few bins and add things like puppets, blocks, puzzles, and games. Switch the contents often and connect them to classroom learning. Young children are concrete learners who learn by doing. This is why play is such a powerful tool! Instead of using pencil and paper to teach new concepts, use manipulatives. They don’t have to be fancy teacher-store items either. I once had a class whose favorite manipulative was a big bucket of old keys! Art materials for just about everything. Use games to practice and review concepts. They don’t have to be complicated or even competitive. We know our students need breaks, and recess is often too short. After a bit of hard learning, reward your students with a play break. Pull out your learning centers and let them have a few minutes to relax and re-energize for your next lesson. There is lots of learning that can be done outside, no matter the weather. Gone hunting for letters and words. Dramatic play is natural for children and puppets and stuffed animals that talk are quickly accepted as teachers and friends. What’s more, students will often listen and respond to a puppet in a way they never would for a teacher! Instead of having students retell a story – act it out! and whatever else you can come up with! Students love to be chosen to be actors and they will be fully engaged in learning! When students are playing, don’t be shy – join in! Playing together builds bonds with your students and creates a classroom community of shared learning and fun. Plus, as a participant in the play, you have the ability to scaffold the student’s learning and to stretch them and challenge them and help them to grow! Imagine two intros to a lesson. In the first lesson, the teacher might show some photographs of each animal and talk about each one. In the second lesson, the students actually pretend to get on a plane, land in Africa, and view the photos of animals placed around the classroom in the role of explorers in a new land. Both lessons will teach the same content, but one feels like playing. The best part – to the students, a journey to a new place in their imagination is almost the same as being there, and they will remember the lesson months later. Parents love their children and want them to learn – and so do you! If parents (or administration) are giving you a hard time about play in the classroom, try to show them all the learning that is happening. Through my classroom blog I will often include a photograph of playful learning in action. I explain exactly what the students are learning and how I am assessing their learning through play. (In the days before blogging I used to do the same thing in my weekly newsletter.) This has gone a long way towards gaining support for play in the classroom. No matter what, don’t give up! The power of playful learning is worth fighting for. How do you encourage playful learning in your classroom? What is your favorite way to play with your students? 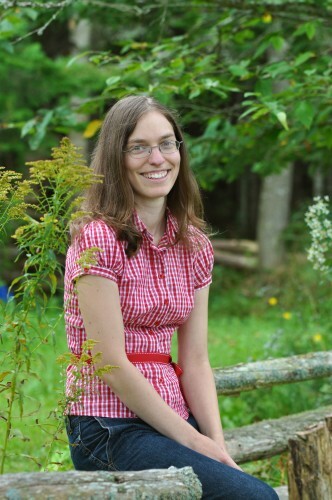 Andrea Sabean is a teacher who is passionate about early learning and play. After 14 years of teaching young children, she is now a college instructor, inspiring the next generation of early childhood educators. 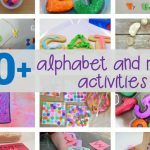 She is also an artisan who loves to bring children’s drawings to life, and shares her creative adventures on her blog: Artisan in the Woods. I love how this post ends – the power of playful learning is worth fighting for. I think we all need to remember that in spite of the CCSS, these are still young children, and young children learn so much through play! I absolutely love your post and feel exactly the same. There is so much pressure to squeeze in all of the standards that play is often ignored …we have started calling our self-selection time exploration investigation, in order to label it in a way that helps admin as well as parents see that it is a learning time as well. Frustrating that I feel the need to defend it…but it is what it is. Thanks for the post! We are happy to hear that you’ve found a way to keep play and exploration in your classroom schedule. Thanks for sharing your tip! I really enjoyed this post! I am actually working on a paper about play-based learning, and this has given me a lot of insight on where to go! do you have any tips or advice for research or personal knowledge?